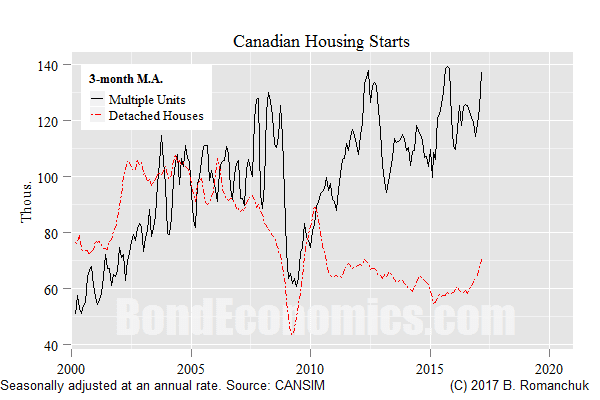 Bond Economics: Canadian Housing Crash (Again)! The news that some Canadian alternative mortgage lenders have had financing issues has brought around speculation about the Great Canadian Real Estate Crash. Certainly, the Canadian economy is extremely vulnerable to another global financial spasm like 2008. I am somewhat of a Negative Ned, and can think of many catalysts for such an event. However, barring such an event, the problems look like they can be contained managed. 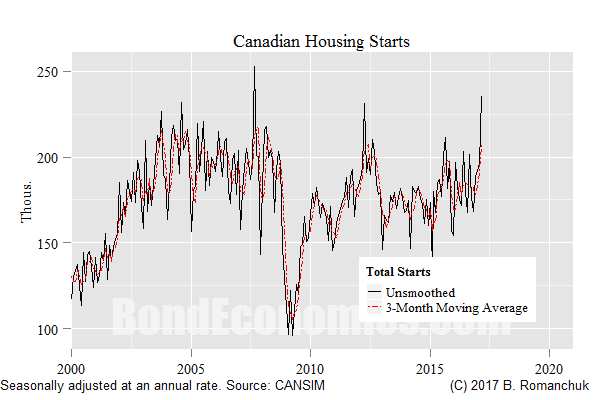 Whether or not the Canadian housing market will have an obvious collapse is not clear. I discussed the issues way back in 2013, (This followup explains why predicting a "collapse" is difficult). But regardless of the precise trajectory of Canadian home prices, it is safe to say that many younger Canadians are trapped by having too high a level of mortgage debt. This was a very preventable public policy disaster. Therefore, unless there is a dose of wage inflation that comes from somewhere, the outlook for the Canadian middle class looks grim. As I stated in my earlier articles, I am not particularly concerned about house prices. The lack of good data from Statistics Canada is one issue, the other is that I do not see house prices as being the issue. The real concern is employment: if too many people in construction lose jobs, that creates a negative feedback loop. The latest spike in housing starts (above) attracted some attention, but that could easily have been related to the weather. I was out bicycling in March, which is not a normal seasonal activity in Montreal. (Admittedly, there was some amazing cross-country skiing two weeks later.) I do not have the non-seasonally adjusted data to be able to evaluate this, unfortunately. If we ignore the latest spike, we see that activity has been relatively moderate in recent years. This probably reflects the tightening of mortgage lending standards. The chart above explains my somewhat limited concerns. Construction of detached houses has been mired at low levels for almost a decade; all of the activity has been in multi-family dwellings. Although not solely condos, they are presumably a large part of this. In other words, construction activity is relatively concentrated; we do not see the construction of McMansions across Canadian suburbs. The condo market is presumably vulnerable. However, we did have a speculative condo bubble in the early 1990s in Toronto and Vancouver, and it was unwind without a crisis (unless you owned a condo). The Canadian banks are diversified, and not at risk if only a narrow part of their customer base is in trouble. Even if the market dries up, it will take time for the existing pipeline to finish construction. Furthermore, I believe that Canadian condo financing is less exuberant than the pre-crisis American custom; construction does not go ahead until 50-60% of the units are presold. In order for the scarier scenarios to play out, there needs to be a larger shock to hit the wider Canadian economy. Given the synchronisation of business cycles, some form of global recession will eventually hit. All we can hope is that Canadian politicians relax fiscal policy in the face of such a downturn, and that some of excesses in real estate will have already been worked out. The same thing is happening in Australia. Wage growth is weak. There is a degree of high risk lending that the authorities are trying to rein in. There is also money pouring in from China driving demand. However, interest rates around the world are very likely to continue increasing. This will severely stress some mortgagees and, coupled with authorities endeavouring to slow foreign funds inflow, will inevitably turn the supply demand balance in the other direction.